Why not coming to Prague during the winter and enjoy a completely different atmosphere. Enjoy the Christmas market at Old Town Square, go ice-skating to Ovocný trh or ski down the Petřín hill. No, we´re not kidding you about the skiing part. Looking for an authentic culinary experience? Order a Czech tasting menu paired with Bohemian and Moravian wines. Want to try? Order your own Czech tasting menu. Missing the summer? Check out the unique indoor surfing arena where you can rollick like on the Hawaiian islands. Want to try? Order your own indoor surfing arena experience. Tired of the festive atmosphere? Enjoy something completely different - an escape game where you have to avoid the murderer and get out in time. Want to try? Order your own escape room game. Looking for an original spa treatment? It wouldn´t be Prague with its very own beer spa. Bathe in beer an have a few pints at the same time. Want to try? Order your own Prague beer spa. Is the winter getting on your back? Enjoy some relax in the Tawan studio in Prague and choose from various Thai massages for individuals and couples.Want to try? Order your own Thai massage in Prague. Coming to Prague in winter will leave you with a different idea of the city, that is normally crowded with tourists from spring to autumn. Enjoy serene walks through the Old Town and watch the Hradčany panorama covered in snow from Charles Bridge. Take a romantic horse carriage ride through the streets and finish your day with a beer in a hidden cozy pub or at one of Prague´s best restaurants. A great souvenir opportunity and of course the place to go for the best-mulled wine. Even though the traditional Christmas market at Old Town Square is more of a celebration of consumerism that the modesty of Christ, you will enjoy the lighting of the tree and tens of folk performances like when you were a kid. The fun thing about Prague and its hilly elevation profile is the fact, that you can actually ski right in the center of the city when there´s enough snow. The Petřín cable car will take you up with your equipment - skies, snowboards or bobsleds - for the price of a basic public transport ticket and you can ride down the Petřín hill as if you were in the mountains. Cross-country skiing is also possible in Prague - fans of this sport like to train in the Hvězda game enclosure, where you can also visit the beautiful one-of-a-kind hunting castle from the Renaissance era. If you wish to find a real ski slope, the most popular Czech mountains Krkonoše are just a 2-hour drive away. 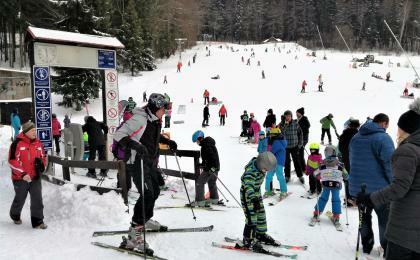 The ski area od Monínec is even closer - just an hour drive south. Wish to escape the crowds? 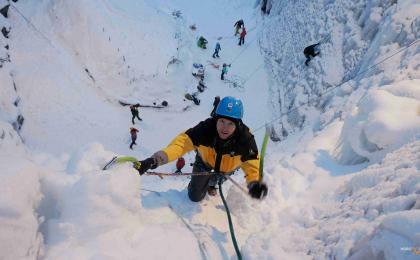 Explore Prague in the winter or sign up for a typical Czech skiing trip to the nearby mountain resorts.